April is National Poetry Month. It was established in 1996 by the Academy of American Poets with the hopes of "increasing the visibility and availability of poetry in popular culture while acknowledging and celebrating poetry's ability to sustain itself in the many places where it is practiced and appreciated." (poets.org). At the start of the month, I pegged April 26th as the day our family would experience poetry with a birthday celebration of one of my favorite poets and with one of my favorite poetry activities. Today we are celebrating Renee LaTulippe's birthday. I have gotten to know Renee through the 12 x 12 Picture Book Writing Challenge. One of the things I have learned about her is that the word "busy" does not even to begin to describe her life. She is an author, poet, editor, video blogger, wife, and mother of twin boys -- and she sings in a local choral group in her town in Italy! She writes educational materials for All About Learning Press and has published books with her co-author, Marie Rippel including Lizard Lou: a collection of rhymes new and old and What am I? : a collection of short stories. Renee has been described as, "one of the top editors in the educational market today," and also works with adult authors to polish their work. (WordSpark Editing). I have become one of the biggest fans of her unique blog, No Water River, where she delivers her poetry not only in text but also in video. To celebrate National Poetry Month, Renee expanded her video poetry platform to feature numerous poets and authors sharing their own poetry including the U.S. Children's Poet Laureate, J. Patrick Lewis and Deborah Diesen, author of The Pout-Pout Fish (a family favorite!). Renee expressed her thoughts on video poetry on Katie Davis' Blog, "Poetry is alive! Poetry is meant to be spoken and heard and savored by ears, mouth, eyes, bodies." Additionally in an interview with DeoWriter she said, "I like the idea of setting a poem free in the wild, unfettered by walls and ceilings." Our family had to try our own video poetry to celebrate Renee's birthday. Her idea of presenting the poems "in the wild" actually led us to write poems about two events that are happening right now in our own backyard. Three days ago we noticed a bird's nest under our deck. 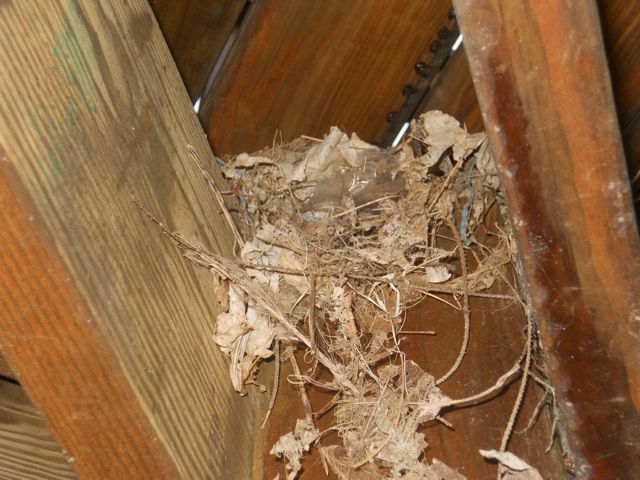 My daughter was worried that the nest contained trash. She asked, "Should we take it out for them?" This picture was taking through the slats of wood on our deck. The first day we saw that the nest had only one egg. When we took this picture there were two eggs. The following day we saw three eggs. 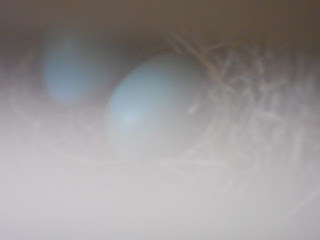 We learned that American Robins will usually stop at four eggs. My kids are looking forward to the seeing the last egg. 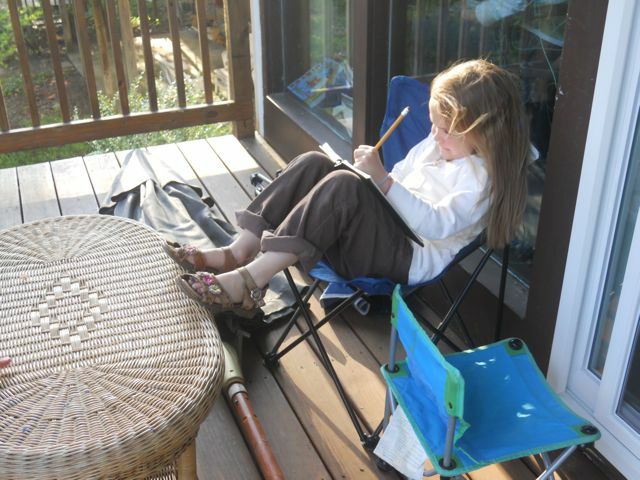 Here is my daughter, who will be seven years old next month, working on her poem. I was excited to find a post that Renee wrote for the All About Learning Blog describing her first poem that she wrote at the age of seven. in a nest made with straw. My suit is bright white. My hive is brand new. with so much to do. I must keep them warm. so they do not swarm. It is complete coincidence but so appropriate that, April 26th, is also national Poem in Your Pocket Day. I decided to carry the poem Jake the Snake by Renee LaTulippe in my pocket. Random strangers better watch out while I am running my errands today as they may hear some hissing coming their way as I read this fun poem to whoever will listen! Stop by No Water River today to find a poem by Renee LaTulippe or one of the many other poets to carry in your pocket. My most memorable birthday was when I turned 30 and celebrated by jumping out of a plane. When I was a little girl, I remember going to the airfield with the family to watch my dad skydive, a hobby he had picked up when he was in the Army and stationed in Germany. This was back in the day when they used the traditional white silk parachutes and the landings were harder, so before jumping, Dad practiced the hit-and-roll by leaping off a really big crate. After that, off he'd go in the plane, and we'd be there scanning the sky, waiting to see the white dot. The funny thing is that -- at least in my little girl memory -- we usually heard him before we saw him. My Dad had a big tenor voice and sang all the time -- though apparently he had also picked up yodeling on a couple of side trips to Switzerland, so he'd yodel his way down from the sky. Those are images that never left me, and I always wanted to know how it felt up there in that vast quiet blueness. So I jumped from 13,000 feet. And since I knew I would probably do it only once, I got the deluxe package that included a somersault out of the plane and video and pics on the way down. The best part was the free fall, an exhilarating 45 seconds of rushing wind and tilting horizons. Then the chute and total peace. That's when I understood the yodeling, and had I been alone (it was a tandem jump, of course), I might have tried it myself. It's such a feeling of liberty that singing is practically mandatory. The only thing that could have improved that birthday memory is if I had jumped with my Dad...but by then he'd come to his senses! Renee, thank you so much for sharing your birthday story and for inspiring our family to create our own video poetry. We hope you have a wonderful birthday! Eat lots of cake! Happy birthday, Renee! I can't think of a better author to celebrate for National Poetry Month. Eric, thanks for shining the spotlight on such an amazing person. Incidentally, my blog will feature a found poem about ladybug larvae tomorrow. I'm not knitting them sweaters, though. Happy birthday, Renee! You are much braver than me. A somersault out of an airplane? Yikes! Beautiful poem, beautiful video! Happy Birthday, Renee! What a beautiful, sunny poem you picked to highlight her day, Eric. Renee, you look gorgeous! And I also love your and your daughter's poems. I hope the bees are ok and that you will see baby robins soon. Lovely post! Oh my goodness!!! BEST HAPPY BIRTHDAY AUTHOR post ever!!! Your daughter and her poetry video--ADORABLE!! Your poetry video--HYSTERICAL. (Renee needs that video at NWR, BTW) And Renee, our beautiful birthday girl and my dear friend--What more does a post need??? I agree, Natalie! This post has it all, and is such a gift to me in itself! Thanks Natalie! I am so glad you enjoyed the post. I was so excited to see my daughter get so into her poem and video. She has watched many of Renee's videos and knew exactly what to do. Renee - I have 9,999 more sweaters to go! But, after this attempt at video poetry, I am one "small" step closer to being courageous enough to appear on NWR! Yes! 10,000 bees. You buy them in a 3lb. "package" (it is really a screened-box) that contains roughly 10,000 bees! Thank you so much, Helga -- and likewise! Eric, I must admit I got a little teary when I saw this post. It's absolutely lovely and wonderful and -- well, I am just honored to be part of HBA! I am especially thrilled that both you and your daughter did video poems, and both so well done! Your daughter's poem is much better than the one I wrote at her age, and her chirping is perfect. But those bee sweaters...HAHAHAHAHA! You're a nut. I am so happy you enjoyed the post. We had a blast with the video poetry. My daughter will be happy to hear that you liked her "chirping". She was quite pleased with the ending to her poem. This was such a fun post to read, Eric. I love the poems by you and your daughter! Happy Birthday, Renee! I love sunflowers, and so I enjoyed your poem. Thank you, Tina! That was the very first video I did, months and months and months before I actually launched the site! Loved it! Loved your daughter's Here Lay the Eggs. Only 6 and such a feel for words...awesome! Your bee sweaters are sure to cause quite a buzz in the bee fashion world. Your poem was perfect. Thanks for the interview. You are one brave girl...jumping out of that plane, Renee! That had to be a great experience. Hi, Eric and Renee. So glad that I have gotten to know both of your blogs this year. Happy happy birthday, Renee!! And Eric, I loved your daughter's poem and yours. A very talented family you have! Thank you, Kerry! I think Eric should put together a family act and take it on the road. I really enjoyed this post, Eric. Your daughter's poem is lovely-- good luck with the robins! Hmm....skydiving poet...flying poem...that could happen! What a joyful celebration of Renee's birthday and poetry too! I do love that sunflower poem and am grateful for all of the brightness that Renee has brought to the Kidlitosphere with her writing, her generosity, and her sparky spirit. She must feel honored that you shared two family poetry videos in honor of her day. I love them both! Good luck with the baby birdies and bees. You have one of those very cool hives that we've been talking about at our home too. Happiest of birthdays to Renee! Why am I not surprised that you have jumped out of a plane? a. Yes, Amy, seeing those two videos was FANTASTIC! I hope more and more people set a poem free in the wild for everyone to see! Thank you for all your kind words. What talented people and bloggers, I am meeting in the 12x12 group. Eric I feel you outdid yourself in this birthday celebration for Renee. loved yours and your daughter's video poems and can't wait for those eggs to hatch or the photos of the bees in hand-knitted sweaters! Renée, sunflowers so make me think of Southern France, and I guess your area... what a sunny, smily poem to celebrate your special day. Eric, what a wonderful post and mission for your blog! I couldn't help but notice your daughter is a leftie... as a leftie myself I am always on the look-out! What a lovely poetic voice she has. Tell her to keep going! The world is waiting! And yay for Renee's birthday. I love the video of her with the sunflowers because that's exactly how I perceive her. Thanks to all for sharing! Thank you for the kind words, Irene. And isn't Eric's blog wonderful? Really a stroke of genius! Eric, your birthday tribute to Renee is thoughtful, delightful, touching!! What a talent your daughter is. I loved her poem and I appreciate the photo of the eggs. This was a FUN read from beginning to end. I mean, who hasn't wanted to sit in a field of sunflowers and be brilliant?! I had fun here. Thanks! I might be biased, but I agree that this post is thoughtful, delightful, and touching - I got choked up. Such a gift! Happy birthday Renee! I absolutely loved Sunshine Face. Eric, you already look like the professional Beekeeper- super poem. Your daughter's, Here Lay the Eggs poem was just lovely. Thanks, Jen! YES, I forgot to mention Eric's beekeeper ensemble - love it! I would probably wear two of them. That bee sweater is too much! Thanks for your bday wishes. I was dreading the bday memory part, but then I thought of my dad and remembered those great days. Delightful celebration of a delightful poet! Thanks to your daughter and to you, Eric, for your videos, as well as for celebrating Renee's birthday in such a perfect way. Renee -- love your Sunshine Face! Wow so much to say, Happy Birthday, Renee. Those quotes of yours are lovely, the poem divine and Erik, your daughter's poem is wonderful too and so well spoken for a young one. Thrilled that you've sky dived Renee, that is exciting. Isn't his daughter impressive? When I was six I was still hiding behind my mother's skirts. In fact, I think I did that til I was 20 or so. Eric, I also forgot to mention how much I LOVE the title of your daughter's poem HERE LAY THE EGGS. It's a poem in itself, and so very lovely. Makes me want to write a poem with the same title! I just read my daughter all the comments that everyone has made about her poem! She was thrilled! Thank you so much! Happy birthday, Renee... I'm more of a lurker on 12x12x12, but have enjoyed getting to know you and your blog through the FB page. Great bee sweaters -- you were right, the videos were fabulous! Thank you Colleen. I will ask her about the poetic scientist! I think that would work for her. She just asked for science experiments and materials for microscope for her birthday! Thank you, Colleen! I'm glad you've been lurking. And I agree the poems were fabulous! Happy Birthday Renee! I am so glad to see you featured on Eric's blog. The more I learn about you, the more I REALLY want to meet you. You are so full of awesome! And Eric, both you and your daughter's poems are amazing. What a great tribute to Renee and to Poetry Month. As always, love what you do. Thank you so much Julie! I wish you all could have seen my daughter's smile yesterday when I read her the comments everyone has left about her poem! Thanks, Julie! Maybe the next time in Bologna! Wow. Flabbergasted by your daughter Eric, and so glad to have met you and Renee. Renee, have you ever written a poem about the jump you made - would love to 'view' it! Julie, I never did write a poem about it. And it was so long ago, the video is on VHS! Some day I will convert it and write it - that would be fun(ny)! Eric, your daughter's poem is adorable. I think that's great that she did a video. I get a lot of birds coming to my place and just love seeing all the nests and hearing the chicks tweet. Renee the story of your dad is cool. My husband would kill me if I ever jumped out of a plane and I'm too scared to actually do it. Thanks, Rena! The jump was pre-husband and kids - I wouldn't do it again now! Oh...running late, as usual, but you can keep celebrating you. Happy Birthday!!! Love that your little girl is expressing herself so beautifully. Lovely! Great job on the blog post Eric. I would love to keep bees! What a fun, new adventure for you! I had never heard of this book. I'll have to read it. 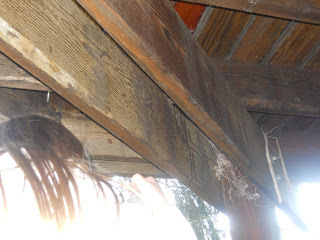 Cute nest pictures! It'll be fun to see them hatch. The video with your daughter was amazing! I really liked this post. Your blog just gets better and better! I'm paying the Sunshine Award forward to you since your blog is so inspiring and brings so much Sunshine into so many lives! I'll give you the details later this week after I have a chance to catch up with my backlog. and then please pass the Sunshine Blog Award on to 10 bloggers who inspire you! Thanks Sandra for the Sunshine Blog Award!